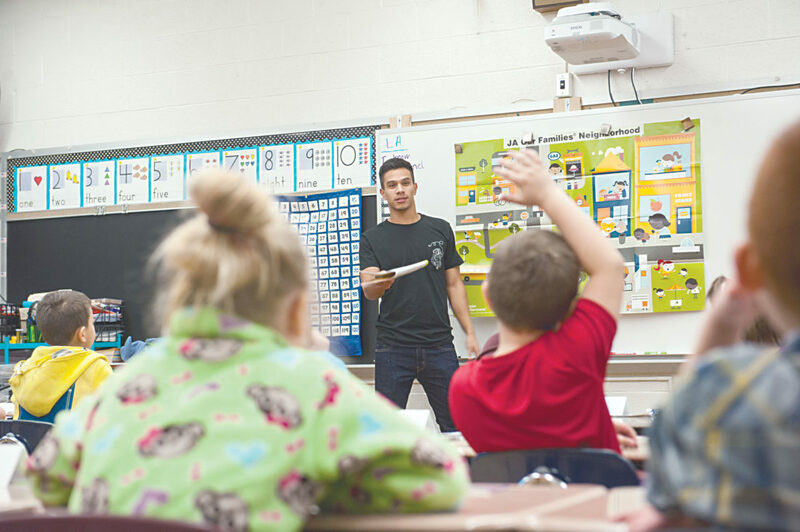 PHOTO SUBMITTED Rodrigo Meza, a sophomore business administration major from Chula Vista, California, teaches March 28 at Washington K-1 Elementary School. Meza was one of 16 Heidelberg University students who visited the school to teach the JA in a Day program. The Junior Achievement program focuses on career success for students. As part of the program, Heidelberg University students volunteer their time working with children and, this year, they are moving into Washington K-1 Elementary School to work with younger students. According to Hasseb Ahmed, dean of the School of Business, Computer Science & Information Technology at Heidelberg, the JA program focuses on the three pillars of financial literacy, career preparation and entrepreneurship. “Looking at what’s happening in society, all three parts are very vital for economic prosperity, growth and success of the population,” Ahmed said. In addition to students, community members also volunteer their time to come into the classrooms to work with the youths. This year, the dean said, the program is looking to teach 1,500 students within Seneca County. He said the School of Business, Computer Science & Information Technology have been working closely with the superintendent at Tiffin City Schools, Gary Barber, and other TCS staff members to find the needs of the students. In the grades K-1, 16 classes are to be covered. “Teachers decide based on their needs,” he said. Heidelberg students volunteering their time are from the Dean’s Student Advisory Board. Other schools participating in the JA program are Krout 2-3 Elementary School, Tiffin Columbian High School, Tiffin Middle School and Noble 4-5 Elementary School. There has been a 10-percent growth in students covered by the program, Ahmed said. Having been a volunteer, Ahmed said working with the students — in games and engagement — is fulfilling as a volunteer. “Technology has definitely changed the way we work today,” he said. Ahmed said there is a shift in how students are prepared in higher education and K-12. By the time the elementary students enter the workplace, it’s going to look and feel different, he said, in part because of a gender gap in understanding financial issues and a shift in the desired workplace skills. Heidelberg also hosts the Business Challenge Competition for Columbian, Mohawk, New Riegel, Hopewell-Loudon and Old Fort high schools each spring.